In the beginning of January I bought the GoPro Hero 3 Black Edition, the flag ship of the GoPro series of action cameras featuring very impressive specifications. Seven months later I sold it. I'll explain the reasons below. My main video camera is the Panasonic GH2, which with a suitable hack still is one of the very best hybrid cameras/videocameras available. It is a competent still image camera and the video quality is far superior to that of the Canon EOS 60D, which I've previously had. Being a m43 camera it is also small and light, which also goes for the optics. I'm very satisfied with it, but since it is not weatherproofed, I needed something to complement it with. Despite me being less than impressed with POV videos, I still decided to buy the GoPro Hero 3 Black Edition when it came out, since it was so impressive on paper and all the pseudo reviews on the internet just said it was the best thing ever. The first promotional video also showed that it can yield truly excellent results. The resolution in 2.7K video mode is great, probably very close to that of the GH2 in 1080p mode. The fisheye lens is the worst part of the camera. The very wide field of view gives a good illusion of speed for POV purposes, even when there is none. The fisheye distorsions makes the lens fairly unusable for anything else, and even in 2.7K mode there is not that much resolution left after defishing the video in the editor. No shutter means that the GoPro uses far too fast shutter speeds in good light. I didn't like the lack of control over the exposure. The automatic exposure isn't always right. The excellent time lapse functionality is hampered by the lack of exposure control and the strong optical distortions. No viewfinder. The smart phone interface over WiFi is great, but does not replace a viewfinder. The form factor is good for one purpose, the chest harness, which is one of the best POV angles. For anything else, the form factor of the Contour or Sony action camera would be better. The colours didn't mix well with those of the Panasonic GH2. The above observations might sound a bit negative, but keep in mind that I really bought it for the wrong reasons. A quick search on the internet should give plenty of positive reviews. To replace the GoPro Hero 3 Black Edition I wanted a weatherproof compact camera with good video quality. The weatherproof compact cameras generally don't have a great image quality, but after some googling and remembering the videos made by Joe, I settled for the Panasonic FT series. The FT series have a good video quality and support for the 25p frame rate of the PAL world, which is missing from many other alternatives. As it happened, the new Panasonic FT5 was about to be released, enabling me to find the FT4 for a very good price from a Finnish web shop. I ordered it and it arrived. The first tests showed it to be pretty much what I expected. The still image quality is like that of a low end pocket camera, but the video quality is better. It has some sort of periscope optics with a maximum aperture of F3.3 in 28 mm equivalent focal length. There is only one other aperture alternative, F10, which I assume is an ND filter, since it would not make sense to have a true F10 in a camera this small. The diffraction would affect the sharpness too much. The time lapse mode is unfortunately mostly useless, with a fixed interval of one minute, but otherwise the camera seems to have everything needed in a camera of this kind. I decided to do a video during an overnighter two weeks ago with this camera only, in order to test it thoroughly enough for my purposes. 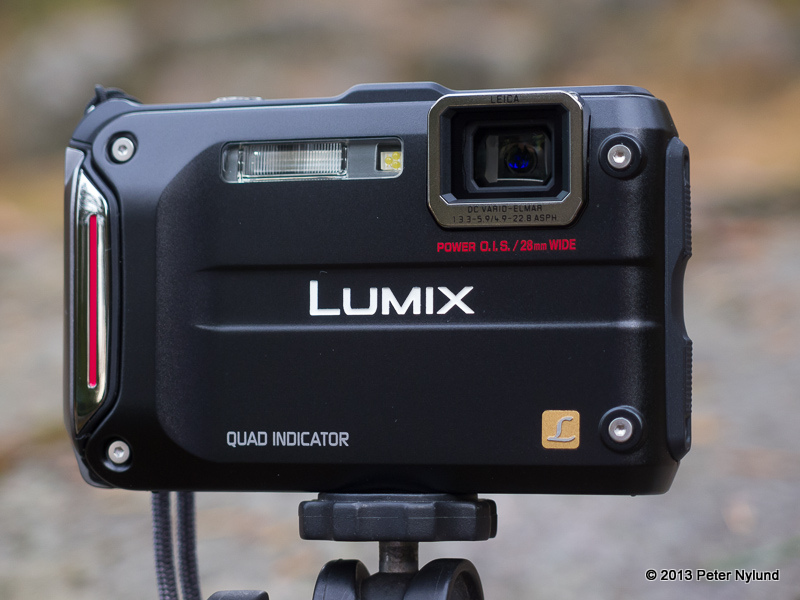 The Panasonic FT4 supports both MP4 and AVCHD video recording, with a little lower bitrates in AVCHD mode. I'm assuming that the video quality is the same in both modes, since the AVCHD can probably make do with a lower bitrate due to a better compression method. The maximum bitrate I encountered in MP4 mode during this test was 23 Mbit/s, which isn't too bad (the hacked GH2 does over 60 Mbit/s, though). The following video was the result of the test. I'm actually quite satisfied with the result. The camera is quick and easy to use and the video quality is quite ok. The actual resolution is lower than that of the GH2, which might (barely) be visible on Vimeo, but I would still estimate that it is better than that of the Canon EOS 60D. The dynamic range is lower than on the GH2, but the colors seem quite similar, so there should be no problem mixing the footage of the two. The automatic exposure in video seems good, choosing suitable shutter times. I dialed in exposure compensation based on the on-screen histogram, but otherwise I let the camera do its thing. Some handheld shots also showed that the image stabilization worked fine.